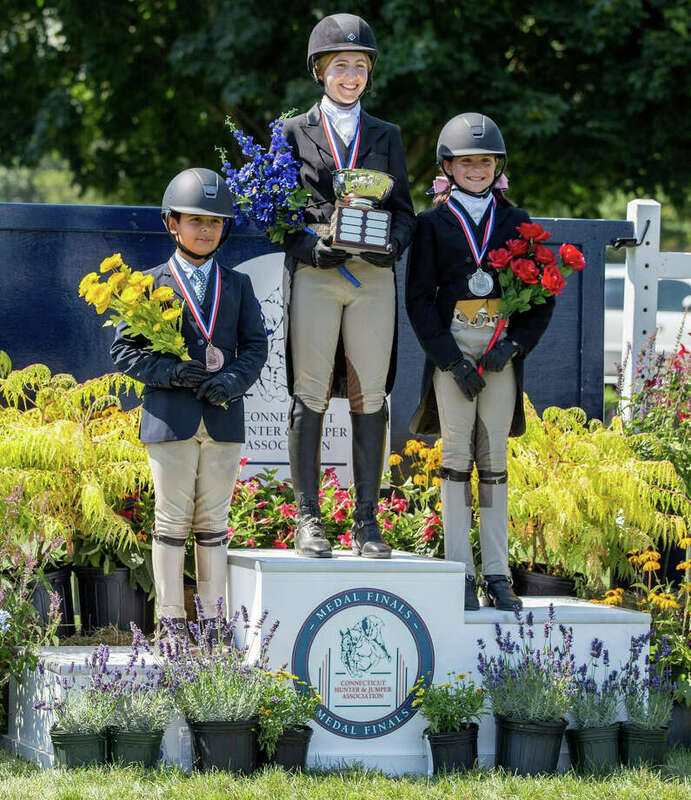 Westporter Julia Beck, center, stands atop the winner's podium after winning the CHJA Children's Hunter Pony Classic at Fairfield County Hunt Club in Westport, Connecticut last weekend. Last Friday at the Fairfield County Hunt Club Westporter Julia Beck and her pony Liza Jane won the CHJA Finals Children's Hunter Pony Classic. The pair had to first qualify to compete in the CHJA Finals by standing in the top 25 in the state. Once at the Finals, Beck, 16, and Liza Jane scored an 82 in their first jumping round, putting them in first place going into the second round of completion which comprised of the top 10 ponies after the first round. The pair then scored an 80 in the second round to clinch the win. Later that day, another Westporter, Sara Roche, 33, took part in the CHJA Horsemanship Challenge test, which is a written test based on general knowledge of horse, tack and animal care. The award identifies riders that not only ride well, but whose knowledge expands beyond their riding ability to include all things related to quality horse care. There were 29 riders that took the test and Sara scored the second highest (99). The following day returned to the CHJA Finals and competed in the CHJA Children's Medal Finals against 65 other competitors. Beck scored an 82 in the jumping round and after two rounds of additional testing, was awarded fourth place.